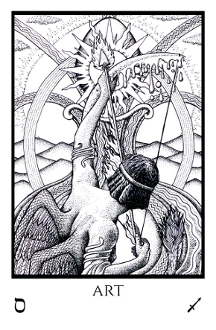 Tabula Mundi Tarot - Majors only limited edition of 499 in black and white, signed and numbered by the artist. Card backs are cream colored with a black design. Cards come in a stardust onyx band with a silver wax seal in a stardust onyx envelope with a black and white lock and key design. You can add a "little white book" of commentary on the cards.